I’ve been thinking a lot about how to plan a wardrobe that gives you options for a wide variety of accent colors. There are other way to go about this, and I’m going to figure them out, but my very first thought was the following. Here’s what your summer wardrobe will look like, after we’ve worked out way through the steps. Assuming that you’re going to be carrying over a few garments from your cold weather wardrobe, I’ve pulled together this core of four in grey. I’m also including neutral footwear – canvas sneakers, and a simple pair of suede loafers. As much as I know that the point of this is to introduce lots of accents, I think it’s pretty important that we start this wardrobe with a grounding of neutrals. So I’m introducing a summer-weight core of four in navy, as well as a pair of simple loafers, and versatile sandals. You do of course understand that this can be done with any two neutrals – I’ve shown lots of neutral options here. Now the fun starts – four tee shirts – choose from any colors that you can comfortably wear with either navy or grey. Maybe you’re one of the fortunate ones who have great legs, and who can wear shorts all summer long. So your next four garments are neutral shorts – navy and grey, of course, but also white, and another easy to maneuver neutral – stone. I think everybody can use a pair of sandals that are basically as close in color as possible to your feet – your skin color is the ultimate versatile basic. Now you’re well-poised to really break out for tee shirts – maybe for 2014 you’re going to go wild with floral prints. Bearing in mind the generally cool color family of all of your neutrals, you can stack up tee shirts in monochrome prints, abstracts, or old-fashioned bouquets. 20 garments – over 100 outfits, easily. Ensembles that could go to a business meeting, or to the beach… These garments would almost certainly all fit into a medium suitcase, eh? I really like where you are going with this. Spring and Summer without a variety of colors to choose from would seem too monotonous. I would add a bunch of colorful dresses. …maybe instead of some of the shorts. I wear dresses a lot, shorts, almost never. And replacing some of the neutral shorts with some colorful dresses would be a way to bring even more color into this wardrobe. Great post for a color lover. I also love dresses for spring and summer, and have noticed the influx of gingham that started about 2 years ago and is now mainstream but also a classic. I am interested in mixing prints with gingham – red or royal or yellow. I plan to sew a shirt dress look (2 pieces) and wonder how to mix the pieces with prints. like Sara i hardly wear shorts -only at home or to the sea.cropped pants do the work for me. as one who lives in a hot country i can not imagine wearing shorts with long sleeve shirts….!! Wearing shorts with long sleeves will forever remind me of taking long walks in cool weather. Your legs are warm, you upper body not so much. I have fond memories of this look. This whole composition is really great, Janice. I love color and can't imagine having a wardrobe where I didn't have a wide choice of color accents. I find many of your capsules too restrictive – even for something as short as a long weekend. I'm glad to see you taking on this subject. What works for me (after years of having lots of colored pieces, but "nothing to wear") is to keep the accent colors restricted to certain pieces. I choose tops/dresses and occasionally shoes. Someone else might choose skirts, handbags, jewelry, or statement jackets/cardigans. Everything else is one of my neutrals. Pretty much everything works together (one can only wear one pair of shoes, or jacket, or whatever) at a time, This allows me to have a variety of colors, but still keep the overall size of my wardrobe manageable. This feels like a real stroke of genius! This type of wardrobe, neutrals + colour, is where I seem to be heading. For summer, I definitely wear 3/4 or long sleeves to keep the sun off my skin. This works if you use linen shirt/tops, cotton tees are not as cooling. And linen pants also, it gets so humid here in Toronto, July-August can be extreme. Dresses are also more cooling and I'm on the hunt for those. My big challenge right now is to have a wardrobe that is versatile enough to cover my different activities. I need more casual clothes to play with and look after my 4 year old nephew, appropriate clothes for massages and stretching class and 'nicer' clothes for lunching with friends, etc. Many days I'm doing a mix of these activities and am challenged as to what to wear out of the house. I don't have a car, I walk and use public transit, so don't want to carry around extra clothing. Sorry for the long comment, maybe your clever mind can work on this a bit and come up with some ideas! Workout clothing is a problem, but otherwise, you might wear something basically neutral and carry a scarf or sweater/jacket to add for lunch out (and for the air conditioning if Toronto is like Richmond – too much AC inside). Or, perhaps this is where you need to step out of your comfort zone and get a couple of bright necklaces or bracelets that you can add to a simple outfit to jazz it up a bit. I'm the one who posted about being fickle about accent colors, and you have answered brilliantly! This post really puts into a picture the thoughts ping-ponging through my brain. You can't even imagine how helpful this is to me! Perfect timing! I was just working out my wardrobe for spring and summer! I usually have a tough time deciding what to do for bottoms, and these suggestions were the answer! Thank you for being so responsive to your readers-WE DO APPRECIATE IT! So fun. I love color and pattern and this just speaks to me. This looks a lot like my wardrobe. I have neutral bottoms – in white, black and denim – and a variety of coloured tops. In the winter, I use v-neck sweaters in colours. In the summer, just t-shirts as my climate is hot and humid. I am very fond of scarves, so this allows me to play with pattern in a limited way. The component I was missing was keeping the "cardigan" layer neutral. I think this provides a much more cohesive look. I must say I am intrigued by the grey. I love your site! I've been greedily devouring your posts since I stumbled on the site two months ago. I've gone through all of your wardrobes, and I'd like to request one since I have not yet found one that I can use as a model for me. About me: I am a 26 year old graduate student in Science Education who teaches a few days during the week and attends meetings and seminars on the other days. I guess I'd say that "business casual" is my style. This winter, I've mostly been wearing dark jeans with blouses and skinny trousers with sweaters (I dream I look like this when I wear it: http://media-cache-ec0.pinimg.com/736x/7f/c6/0c/7fc60cec8a8ea93615abc3f186b3bc24.jpg). I am a petite redhead and love warmer colors. My ideal core colors would be navy (love it with orange hair) and camel. In the colder months, I like to wear rust, burgundy, and pine green. In the warmer months, I like butterscotch, cream, and turquoise. 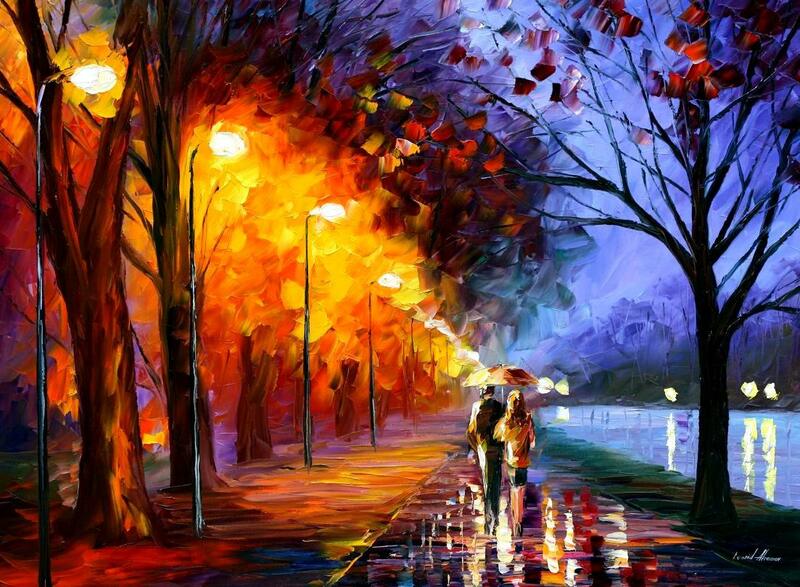 My art inspiration would be something warm and impressionist (like this: http://framingpainting.com/UploadPic/Unknown%20Artist/big/Romantical%20Love.jpg). If you could help me with a wardrobe, I'd be very thankful! Hope you're staying warm in this snowstorm. We're getting ~8" today! LOVE, LOVE the art inspiration!! Hoping Janice takes you up on this challenge! Aubree – you have just about described me exactly and your artwork fits just about every tone in my wardrobe. looking forward to this challenge if Janice takes it up! This one i am going to print and post in my closet. This is exactly the direction i have been heading. (I actually realized about a year ago that i was moving from black to gray and from red red to pink in general.) Bought gray jeans just this week for the spring. Will substitute a turquoise tee for the yellow one and a second shade of pink tee for the coral and grow the shorts to crops and i am done! Well, make a shopping list so that i don't get sucked in by some completely inappropriate, but lovely little something. I can translate this to tunic tops and cotton shirts as T shirts look horrible on me. For skirts I need a ruched top. It means a few more items but your general principles are terrific. This formula is more or less how I dress 80% of the time. Except my wardrobe wasn't pulled together this well. Thanks for the ideas on how to make my neutral pieces more interesting. Love this post, which is great for me with my love of colour – thanks Janice! I won't be thinking about my Spring 33 until next month, but I'll bear this post in mind if I'm tempted by the sales. My best neutrals are grey and navy, so I already have many clothes similar to these items – now to enjoy adding all the colour! I do like your thought process here, and I think this more closely represents my thoughts concerning wardrobe planning. Like others, I have tried to stick to a color palette limited to a few neutrals and one or two accent colors and I find it very restrictive. I just love color too much to limit myself in that way. What I have found to be extremely helpful is to focus on my seasonal color analysis palette. I know people have mixed feelings about this, but for me, it really does seem to be helping. I am a soft summer, so muted and to the cool side. If I choose ALL of my colors using muted and cool as criteria, everything goes together. Right now, I am working with the following neutrals: gray, taupe, and dusty navy. Any soft, dusty accent color I can come up with seems to go with one of those three neutrals. I usually prefer to wear a neutral color for my bottoms and shoes and bring the color in with tops in solids and prints. For my jackets and cardigans, I like to have one in each of the neutrals and a few others in different colors. Oh ! this is wonderful. As a tall woman I need to shop catalogs and "make things work" according to the limited stock available. This is a perfect blue print for what's next when the mountains of snow finally melt. For those who dislike shorts may I suggest skorts ? "Athleta" has a huge variety including at least one knee length style. And, they offer tall. I wore them constantly last summer. Oh my goodness, Janice, were you in my closet?? This wardrobe is uncannily similar to my own summer wardrobe — the Project 333 one that I set up last year thanks to you! I too am a huge fan of colour, especially in summer. This iteration will be so helpful to me this year as I take stock of what worked and didn't work last year. Is this sort of an expanded version of the "Whatever's Clean Summer Wardrobe"? I'm just now switching from winter neutrals (navy/gray) to summer neutrals (ivory/gray) and I had gone back to those posts from last summer to make sure I had the correct proportion of tops/bottoms/dresses. I built a WCSW last year and it was just bliss to pull a random outfit every morning and still look put together. Last summer I chose khaki/coral, but like you Janice it's not my best color. This year I'm going to try ivory instead, which I would normally be worried about wearing as pants but my plan is to keep the ivory to skirts. Somehow it seems like temporary stains wouldn't look as bad on a skirt (I have two young kids. I use a lot of Oxiclean when I do laundry). The idea of having neutral tops _and_ bottoms _and_ outer layers (from WCSW) was a real game changer for me. I had only ever worn neutral bottoms. It's so much easier to put together a wardrobe if you have neutrals in each category. I'm much more deliberate in my use of color now. It's so wonderful to have an organized wardrobe, thanks again Janice for the advice and inspiration. Anyway, I like the idea of coloured tops and neutral bottoms but I think it really needs accessorisation to look stylish. Otherwise it's like a summer version of that old standby – black trousers, bright cardigan. It can look really good, it just needs some extra tweaks i.e. a statement necklace, a scarf, some thoughtful shoes or whatever. I really needed this post. While I enjoyed the common core last winter and worked on my winter basics, when summer came, I was lost again. It's just too hot for me to want layers for 3 months of the year. I turned to the same easy T-shirts and long shorts/capris over and over. This wardrobe exactly fits my needs for summer. Plenty of shirts – they are going to get sweaty and worked over, and great basic shorts and cardis/pants for transition months. Thanks! I would love to see this accessorized, as I feel that I would like a little more interest than just a T-shirt and shorts.